First of all to give you all a bit of context, besides working in IT as a manager I am a trail-runner, it’s what I do and what I am. For the people that don’t know what trail-running is and are interested to read more about it you can go here. But in general it means running in an off road environment through forests, hills and mountains, preferably over long distances. That said, now on to the story I want to share with you. 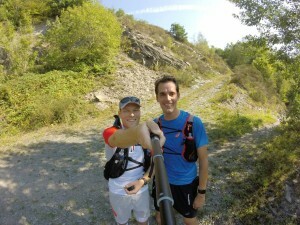 Meet Marc (the guy on the right in the picture, I am on the left, holding the GoPro camera). Marc is and has been my best friend for over 25 years now. 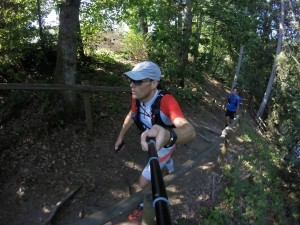 This picture was taken on the start of a trailrun weekend in the Belgian Ardennes where we would be spending a few days together running trails in a challenging environment. The picture was taken when we were roughly 10 km into our planned 45 km run of that day. And as you can see we are still smiling and having fun. A bit later and 20 km further into the day a picture would have looked a whole lot different than this one. The picture would show two people in animosity, not speaking to each other. One of them annoyed and worried, the other one also annoyed but mostly very tired. Now how did we get there from two happy trail-runners to this? For me this was the fifth weekend within two months running in this environment covering several hundreds of kilometers in this exact environment including an actual race event, the Trail des Fantomes. Adding to that, I am running trails on a regular basis and cover around 80 to 100 km of running in my weekly training schedule. This and the fact that this environment is well known terrain for me I can estimate quite well what I am capable of. For Marc it was only the second time in this environment and although he certainly is fit and runs regularly, he rarely runs trails and runs significantly less kilometers a week than I do. When planning our little trail-running trip we talked up front about the distance we would cover on Saturday for our main run and decided to go for a 45 km course that I would set out on my GPS. And so we did and on Saturday morning after breakfast we set out for the 45 km run. This setback and the fact that I kept pulling away from him and apparently clearly showed my annoyance in this demotivated Marc to a point were we could just walk instead of run. Looking at the time and the fact that it would be dark at around 21:00 I started to worry that we would not make it back in time and getting stuck in a pitch dark forrest was definitely not in my plan for the day. So we stopped and considered the options. We discussed and considered continuing staying on the trail along the planned course and try to cut corners where this was possible to shorten the distance or leave the trail and look for an easier and shorter road. Using my GPS device we found a road that was close to the trail we were following and that would lead us to a small village called Nisramont with a road continuing to La Roche, the village with our hotel. So we decided to follow that road, look for a place in Nisramont to get something to drink, refill our hydration backpacks that were already empty and continue along the road to our hotel. And so we did. During the short stop in Nisramont for a few glasses of coca cola we started talking about what happened and Marc taught me a lesson that I normally coach teams and employees in. He explained that we should remember that we were in it as a team and that for both of us it was not going the way that we wanted it to go. Keeping my own pace and leaving a team member behind was not providing us with a solution but was creating a split in the team that only amplified our problems. Auch, point well made and a valuable lesson learned. After our drinks we set off for the last leg of our trip, running together along the road to our hotel which was roughly 10 km away. Moving together at a pace that was comfortable for both of us the kilometers passed by quickly and at 19:30, way before the sun would set, we arrived at our hotel. After a well deserved shower we met up 30 minutes later and went for a drink and a nice meal at which we looked back on the day and what we had learned. Looking back to this afterwards for me it was a clear example of the difference between the struggle of two individuals compared to what you can accomplish when you form a team together. Only after we assed the situation together, looked at what our capabilities as a team were and with that information looked at the options to get to our goal we were able to move forward as a team. The result, we arrived at our goal earlier and in a way that was less stressful for both of us than when we would have continued as grouped individuals.